Do you need help to quit smoking? Perfect Ohm uses tried and true methods to help you quit. Learn more about the NADA protocols and herbs we use to curb cravings. If you are trying to quit smoking, acupuncture is a natural way to help you curb your cravings for nicotine. Acupuncture, along with Chinese herbs, may not be as well-known as nicotine patches or gum, but they can offer relief, especially in the acute phase of withdrawal when you’re wrestling with fatigue, irritability and cravings. Some people try acupuncture because they cannot tolerate the drugs used to stop smoking. Unlike prescription medications, acupuncture has no side effects. In fact, it is very common to notice other benefits like improvements in sleep or mood as well. Acupuncture should be part of an overall strategy to quit. “As an acupuncturist, I target certain areas of the body for certain conditions. When it comes to helping smokers quit, pressure points in the ears are especially effective in suppressing cravings.” The National Acupuncture Detoxification Association supports an entire protocol around this set of ear suppression points for all types of addictions. In between acupuncture treatments for smoking cessation, patients at home can use ‘ear seeds’, which is a form of acupressure. This involves placing tiny seeds with adhesive tape in targeted areas. This techniwue allows patients to self-treat by applying pressure to the points in the ear to help lower the urges to smoke. The cranial nerves, accessed through the ears, stimulate the nervous system to suppress urges and engage the relaxation response. Studies show that acupuncture promotes the brain to secrete endorphins, our “feel-good” hormones. We’re manipulating the body using needles and targeted pressure to help support people as they work through withdrawal symptoms. 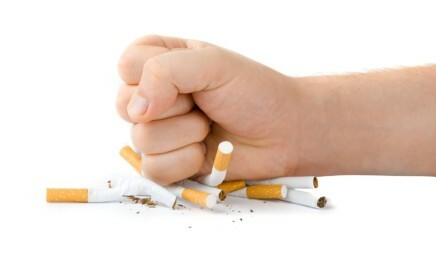 At Perfect Ohm, we have seen many patients who have used acupuncture successfully to quit smoking. They report fewer cravings, decreased irritability, improved mood and bowel movements, as well as sleep. Some research finds that acupuncture’s use for all substance abuse is helpful when used along with conventiona treatments to reduce cravings. Will acupuncture to stop smoking help me? The goal of acupuncture is to help curb any cravings you have for nicotine itself. Generally, our patients are committed, and this is the first step to beat addiction. Treatments range from 2-3 times a week in the beginning, then visits taper to once a week and less as withdrawal symptoms fade. Eventually, all the visits are discontinued when they are successfully, tobacco-free.